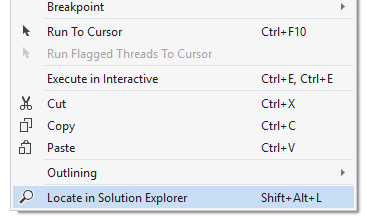 It's been a couple of months since I introduced Experimental Tools extension for Visual Studio 2015 and above. While the 2017 version is being cooked and I've decided to make a quick tour of the features that have been added to it over this time. It also offers to either rename the type to match the file name or rename the file to match the type name. 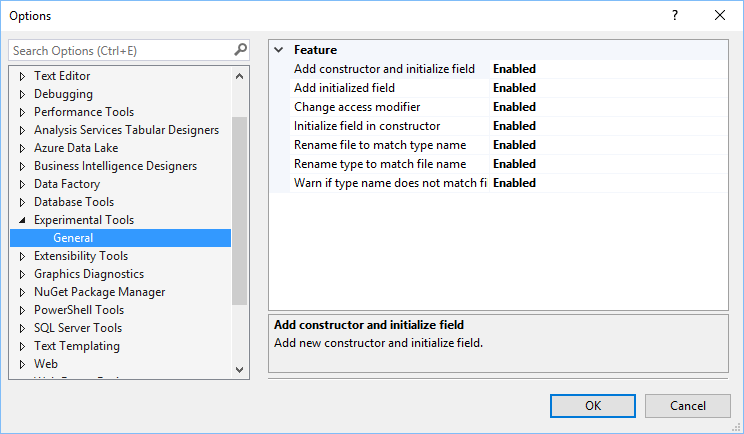 Please note that Visual Studio 2017 provides the same code fixes out of the box so they will be disabled when running inside 2017. However, the analyzer will still work and will enable you to quickly locate places where if you have inconsistencies. By the way, you haven't already, I recommend that you try out the 'Solution Error Visualizer' feature of the Productivity Power Tools extension. With this feature enabled you can quickly glance at and navigate to analysis issues of Error and Warning severity throughout the solution. It assumes assembly name as the root namespace as it's currently problematic to get the default namespace from within analyzers. At the moment it's the analyzer only feature but the code fix is definitely on the road map. It actually reacts to the standard CS1520 compiler error that gets registered for all methods that don't have a return type. If there is no constructor with the same set of parameters the extension will offer you to turn the offending method into a constructor. The command is available in the code editor either from the context menu or as a familiar Shift+Alt+L shortcut. If your InlineData contains acceptable parameters they will be respected unless the test method already defines parameters (in which case neither of the scaffolding refactoring will work). Note that this feature works with xUnit 2.x only. I guess this is it for now. Download the extension and give it a try, report issues if you find any and if you have ideas you're welcome to contribute (or write your own extension, it's fun, I promise)!